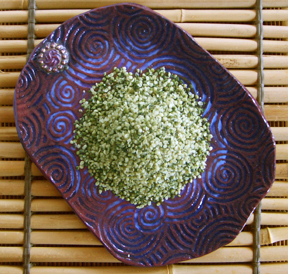 Huo ma ren (Fructus cannabis) is Chinese hemp seed. Hemp seed has a centuries-long history of use as a food and medicine in many countries, and it is easy to understand why. It is extremely rich in nutrition. Ren means seed in Chinese. Huo ma ren is a small green-black seed containing most all of the nutritional components mandatory for life, including essential fatty acids (EFA’s), Vitamins C, E and B, trace minerals, twenty amino acids and very digestible protein. The real nutritional stars of Huo ma ren are a well balanced mix of the EFA’s Omega 3 and Omega 6. Essential fatty acids are known as the healthy, healing fats. They include Omega 3 (Alpha linolenic acid) and Omega 6 (Gamma linolenic acid). They are critical for the construction and maintenance of all healthy cells and govern every life process in our bodies. Without essential fatty acids, life is impossible. EFA's benefit our horses by enhancing cells' receptivity to insulin, making it useful for insulin resistant (IR) animals. The anti-inflammatory effects of EFA’s also enhance joint flexibility. Because of their anti-inflammatory qualities, EFA’s and magnesium pair up beautifully to help horses prone to laminitis. They enhance hoof quality, skin, coat, mane and tail condition, making hair shine. It is excellent for horses bothered by itchy, skin allergies. Many horse owners report more clarity and focus in horses feed hemp seeds. While there are several sources for essential fatty acids, including flax, chia seed and psyllium seed, hemp is considered by many as nature’s most perfectly balanced ratio of 3:1 Omega 3s to Omega 6s. Traditionally, Huo ma ren is used as a yin tonic with an affinity for the stomach and large intestine and is used to improve digestion and support the older patient. Hemp is an ideal addition to the feed buckets of all horses, but it is especially useful for horses prone to colic, hard keepers and horses that have been nutritionally deprived. One to four tablespoons is usually adequate for the 1,000-lb horse. I recommend whole seeds or cold pressed oil (which should be kept refrigerated) instead of pre-ground meal.